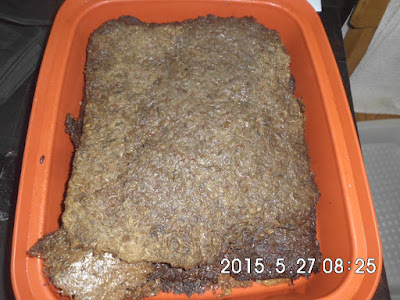 We have been experimenting with sprouted grain bread. There are quite a few variables to assess but slowly we are getting a clearer picture. Making a solid loaf seems beyond our skills at the moment and therefore we are sticking to making a flat bread to use with cheeses, dips and smoked Salmon. 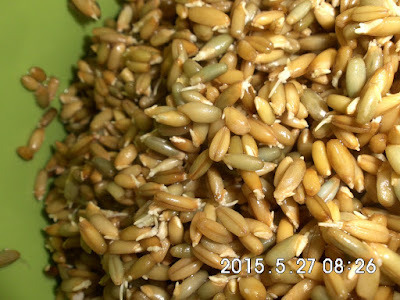 First up only three grains are involved Wheat, Rye and Buckwheat. The Wheat and Rye are dead easy to sprout but not so the Buckwheat. 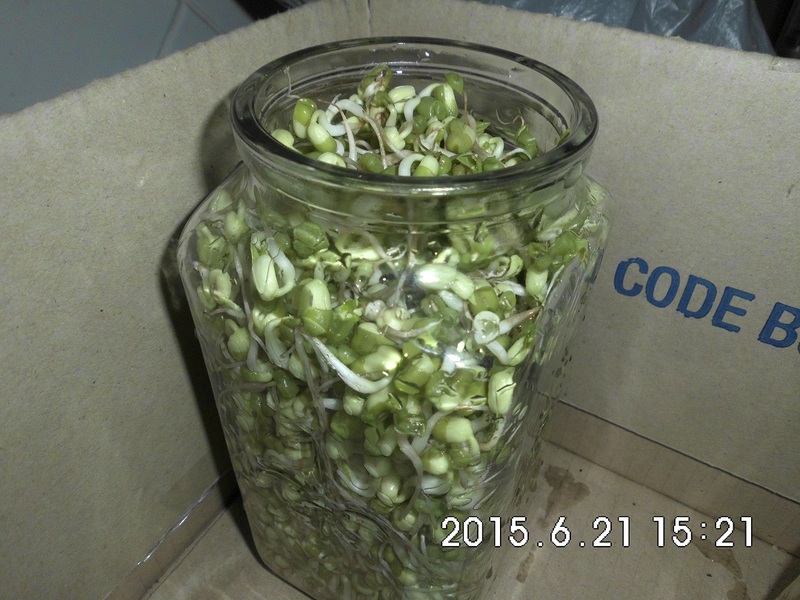 Maybe it isn't of sprouting quality. We tried a different source alongside the original and found the original worked fine. It just seems it needs more than one decent wash each day. At first we limited the sprouting to just the tiniest of white shoots but further reading suggested that getting some green sprouts to appear may be better. The sprouting goes for about 4 days now. 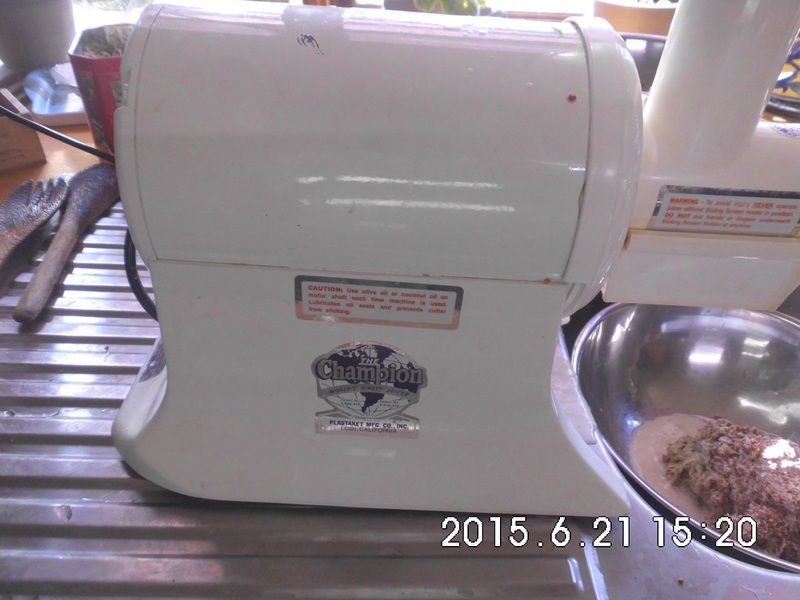 We use a Champion Juicer to mill the sprouted grain into a coarse slop then pat it out onto a flat tray. Usually we make two variations. One is the 100% sprouted slop and the second is the slop with a sourdough starter added 24 hours earlier which gives a acidity flavour. But in the quest for perfection we now stuck with nothing else but the ground sprouts. Broadening the horizons we added Spelt grain to the mix with disastrous results. It had too many broken grains. 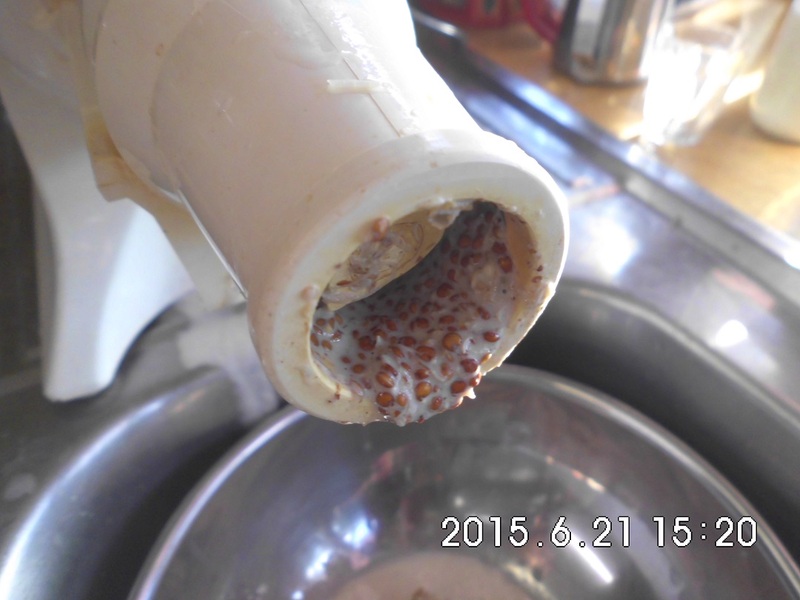 The Quinoa worked fine but the Millet and Sesame seeds failed. 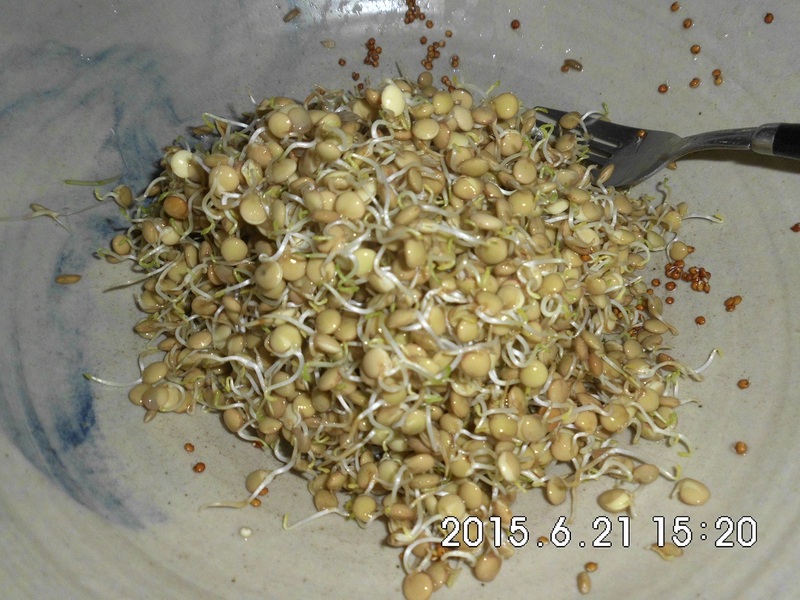 Both Mung beans and Lentils had no trouble. At the moment the trial was about which seeds were easiest to sprout. Later we will try to assess overall flavour with various mixes. Although when you think about it the more variation the merrier. Along the way someone said it was best not to heat the mix above 120 F (48.8C). Although the 150 C baking provided a luscious caramelly crisp biscuit we persevered with the low temperature in the Nara dryer while baking some in the 150 C oven for comparative testing. 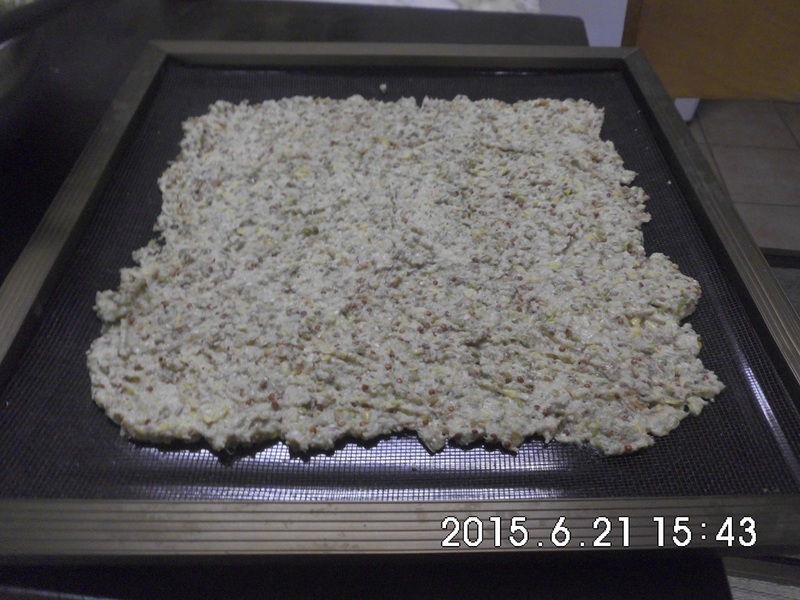 The Nara dryer was adjusted to stay below the 48.8 C. The first batch was spread too thin and we ended with the biscuit breaking up when it was removed from the tray. 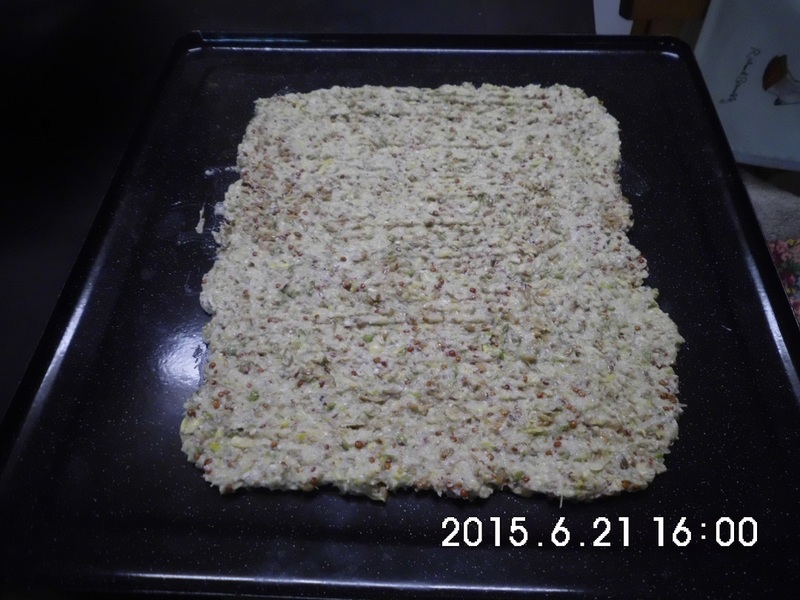 In the next test a much thicker layer was applied, about 10-12 mm thick and only used the dryer. This worked really well and it didn't matter whether it was directly on the tray or on Baking paper. The direct to tray dried in under 24 hours and the Baking paper solution took just a few extra hours. We also added about 10% by weight of Olive Oil. This resulted in the final biscuit not sticking to the cooking surface. The final bread/biscuit is dry and keeps well. We didn't use any sourdough starter either. It doesn't have that nutty caramel flavour of the oven baked version but it at least retains all its goodness. Using the dryer is cheaper than running the oven for six or more hours and burning is not risked. The flavour is hard to describe but probably dried sprouts is most applicable. It goes well with cheeses and other toppings. If you want to avoid traditional breads this is a pretty good alternative, relatively easy to make and versatile. And they say sprouted grains are extremely nutrient rich.